In the past few months, I had grown a little disenchanted with American Vogue. It had become a little repetitive and the fashion editorials seemed to be lacking imagination and pizzazz, so I just figured that I was buying it just to know what was going on in the industry, versus to be wowed by the photography in their pages. This month, however, everything changed. 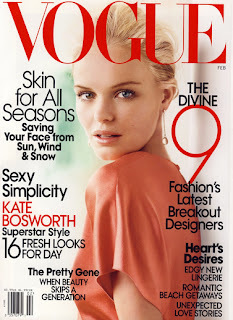 I went to the magazine stand and groaned upon seeing Kate Bosworth on the cover. Great, another actress. But this issue was so incredibly en point! They have an absolutely wonderful article about Christopher Kane and Jonathan Saunders (current growing obsession) and the inclusion of Kate Bosworth is forgiven because the photographs of her with the current "up and coming designers" are tops. I just kept turning the page and my jaw kept dropping, the images were beautiful and it was sort of emotional to see all these designers that weren't around 10 years ago, that I've been reading about for the past 5 or 6 years about how they're the new thing, become part of the establishment. The entire spread felt like a "welcome to club" gesture and it was really cool. My favorite images were the ones with Doo.Ri and Rodarte. I loved the stop/motion photography in the Doo.Ri one and Kate looks really cool flying up in the air with her perfectly blonde hair. Kate and Laura look absolutely stunning in their shoot, and I have to say that the reason why I like their photograph so much has more to do with them than Kate. This was the most relevant issue of Vogue I've read in a while and definitely the best February issue out of all the other glossies. It had everything I wanted to read about and all the clothes I wanted to see (I'm letting their inclusion of Genevieve Jones as a "designer" in the Vogue Index slide, because I'm nice like that). Can't wait for the next one!